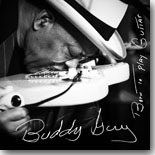 Blues legend Buddy Guy is back with another fine CD, Born To Play The Guitar, with many special guests helping him out. It's this month's Pick Hit. Our Surprise pick this month highlights the new Blind Pig CD, Someone Like You, from Albert Cummings. Our Flashback feature takes a look back at a collection of jazz, swing and blues recordings on Stony Plain from Jeff Healey. Our What's New section features reviews of new CDs from Samantha Fish, Eliza Neals, Ronnie Earl, Ernie Hawkins, Peterson Brothers, Brad Wilson, Crooked Eye Tommy, Ken Tucker, Royal Southern Brotherhood, Betty Fox Band, Hot Roux, and more.